We cover a lot of cool car tech here at Techlicious, from self-driving cars to in-dash Android displays. But the latest innovation from Goodyear caught our eye because it’s both a smart idea and potentially good for the planet. As reported by Wired, the tire company is working on designing an electricity-generating tire. The new concept tire, the BH-03, is designed to harvest energy in a number of different ways. First, it harnesses piezoelectricity, or the electric charge that builds up when pressure is applied to certain materials. It also attempts to harness thermoelectricity, which is generated when there’s a temperature differential in a material. Since the weight of a car adds a lot of pressure to tires, and friction generates a lot of uneven heat throughout, there’s the potential to capture a lot of power using smart tire design. Of course, once you’ve designed a tire that generates electricity, the next step is to figure out how exactly to use the charge. Engineers could apply it to sensors that measure tire pressure and other data that relays back to a car’s computer. Or a connection could be created between the tire and hub to relay electricity to the car’s battery. That would be a great benefit to hybrids and electric vehicles. The BH-03 tire is still highly experimental. Goodyear engineers don’t know yet exactly what materials would be best mix of elasticity and power generation, and they don’t know just how much electricity can be expected in real-world applications. And there’s no telling whether the BH-03 will make it to market in the next decade, if it makes it there at all. Still, the tech is undeniably cool. Hopefully all our cars will one day pull bonus electricity right out of thin air, just the way the folks at Goodyear intend. 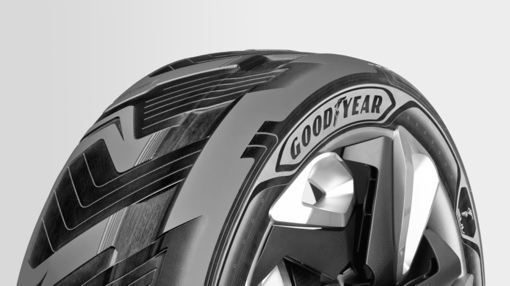 You can learn more about the Goodyear concept tire over at Wired. For more cutting-edge automotive tech, check out our Car Tech & Safety roundup page.